A power of attorney letter resembles a conventional business letter, with additional lines at the end of the letter for witness signatures and a notary seal. The letter heading should carry your name, address and any other contact information you wish to provide. The heading should also carry a date, either above or below your name. Before the body of the letter, you can place either a specific addressee or simply write "To Whom it May Concern" for a letter serving as a general declaration. 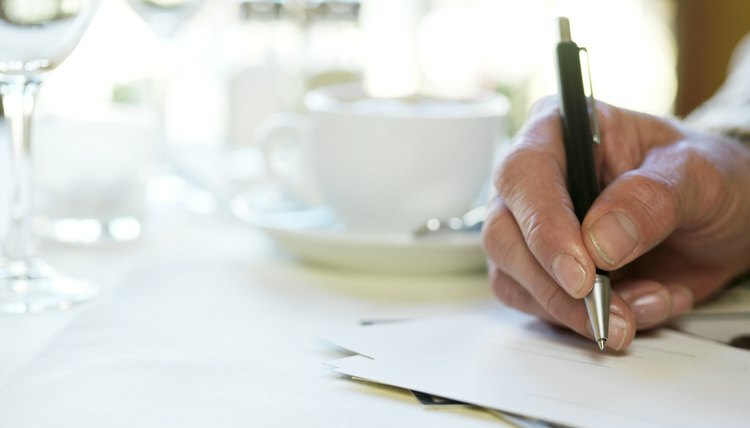 The body of the power of attorney letter must include the name and address of your agent, as well as language to the effect that you are granting authority to this individual to act on your behalf. In addition, the power of attorney should describe the nature of this authority: either general, under which the agent has broad scope to take decisions in any and all matters, or specific, in which you grant only the authority to act in certain areas (for example, the purchase of a property or the signing of a contract). The effective date of the power of attorney should be specified, if different from the date given in the heading. In addition, you may create a contingent (or "springing") power of attorney that takes effect only under certain conditions -- such as your mental or physical incapacity. A "durable" power of attorney remains in effect if you become incapacitated after the effective date of the document. By the law, powers of attorney that are not durable lapse if you do become incapacitated, and all powers of attorney lapse in the event of your death. You must sign the power of attorney in order for it to be a valid document. You should also have the letter witnessed by two individuals, who can be relatives, friends or legal representatives. Many states hold that agents may not act in real-estate actions unless their power of attorney is notarized; for this reason, you may also want to have your signature witnessed by a notary public, who will also stamp and date the "notary block." Some states require the notary signature so check your state's requirements. A revocation may be added to the end of the power of attorney letter. This is a short statement that revokes the power of attorney and has lines for your signature, the date and the signature of two witnesses. You do not have to provide good cause for a revocation; you have the authority to revoke a general or specific power of attorney at any time, unless you have granted a durable power of attorney and have been adjudged incapacitated by a court of law. The state of Washington allows individuals to grant authority to others through a power of attorney. This document authorizes an agent or agents to act on behalf of a principal. A “general” power of attorney gives broad scope to these actions, so such a document should be carefully drawn up and offered only to someone you trust.